Saint Aedh was born at Inis Breagh-Muigh, in eastern Breifne (Co. Cavan), in the year 530. His father was Sedna and his mother was Ethne, of the family of Amhalgaidh, King of Connaught. As soon as he was born a bright light shone over him and he was therefore called Aedh. When still young his holiness was a shining light to his companions, and he worked miracles even then. One day as he was seated under a tree in a wood writing on his tablets, a weary stag fled to him for shelter from the hounds that were pursuing it. When he had grown older he went to the monastic school of Saint Finnian at Cluain-Iraird. He met Saint Molaise there, and learned the holy books and Church discipline with him. 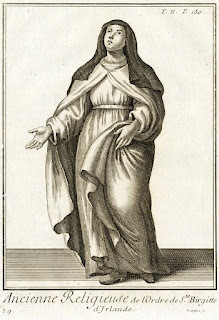 A woman came weeping one day to Saint Molaise and said to him: “O my father, my two boys, my darling children have been drowned in the waters of Loch-Eirne, help me, for the love of God; do something for me.” Saint Molaise answered: “Go to the holy Aedh: he will help you in your trouble." She went in search of him and then told him her sorrowful story. 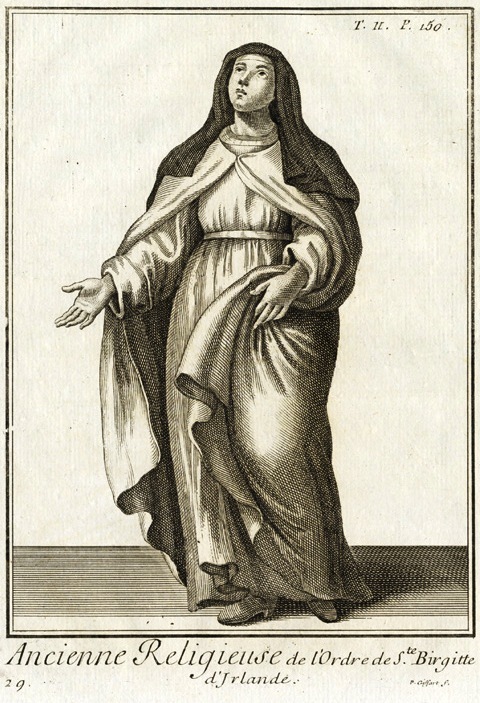 Aedh, filled with pity, went with her to the shore of the lake, and kneeling on the grass, prayed with tears to God and earnestly besought Him to give back the two boys to their brokenhearted mother. God heard his prayer and they came to life. Their father, who was a Chieftain, gave them to Aedh as a gift for the glory of God. Aedh became a hostage soon afterwards to King Ainmire. When brought before the King he seemed so beautiful that Ainmire said: "This youth is very handsome: I will make him one of my followers, if he likes it: but if he should wish to go away he may go." Aedh thereupon said to the King: “My lord, I beseech you for the sake of God to let the others also go free." The King answered: “I grant your prayer, and I ask you in turn to pray for me.” Ainmire afterwards became Monarch of all Ireland. Aedh then went home, but stayed there for only a short time, and at last left it forever in spite of the entreaties of the Chieftain of Hy-Bruin. He said to the Chieftain: “Do not keep me, and may the blessing of heaven be yours for ever." The Chieftain let him go. As he was on his way to Ardrinnigh darkness came down, but he prayed to God for help, and an angel appearing to him as a shining star, led him safely to the house of a holy man named Airedum. Aedh shortly afterwards went to Mynyw (Menevia), in Wealhas (Wales), and became a Monk in the monastery of Kilmuine. Saint Dewi (David), who was then Abbot there, had been taught by Paulinus, a disciple of Saint Germain of Auxerre. The monastery was built in a lovely valley near the sea, and the Monks led a holy life. They worked with their hands, sawed wood, dug and ploughed; and when the work of the day was over they spent their time either reading, writing, or prating. Aedh led a holy life like the other Monks and was beloved by St. Dewi. The Monk who was superior over the brethren working in the fields, one day said rather roughly to Aedh as he was reading a book out of doors: "Go and help to bring in timber from the wood." Aedh at once set off towards the wood, leaving his book open on the grass. As he was on his way there with a cart he came to a marsh, and not being able to go straight on he was about to go round it, but a boy who was with him said: "Oh, how much sooner we should get to the wood if there were a road through this marsh." Aedh said to him: “Make the sign of the Cross on your heart and on your eyes, and you shall behold the power of God.” The boy did as he was bidden, and then saw a road ready-made across the soft and wet bogland. Whilst Aedh was in the wood it began to rain, and Saint Dewi seeing the open book on the ground went out for it, but found it unharmed. He sat down and waited until Aedh should come back with the other brethren. As soon as they had come St. Dewi scolded Aedh for having left his book open in the rain. Aedh, kneeling down, said: “Father, I am guilty, forgive me." But Saint Dewi went away leaving him kneeling on the ground. The Monks then told him of the road so wonderfully made, and he sent back some of them to fetch Aedh, and all went back to the monastery together. Whilst Aedh was at Kilmuine the West Saxons made an onslaught on the Cymry and slaughtered men, women, and even little children. But the Cymry at last gathered together and fought against them, and by the prayers of Aedh, who was on the battlefield, won a great victory: and whilst Aedh was in Wealhas the savage Saxons did not dare to set foot there again. Aedh at length left Kilmuine and sailed back to Ireland. He landed at Hy-Ceinnsellagh (Wexford). When coming on shore he saw some men flying away from a band of robbers. He said to his brethren: " Let us go and help these men that they may not be slain.'' He then rang his bell loudly. As soon as the robbers heard it they stood still, saying: “This must be the bell of some man of God who wishes us to leave off this work." They then hastened to the seashore to welcome him, and their leader wading into the water took Aedh on his shoulders and brought him to land. He afterwards gave himself, his children, and his lands to God and to Aedh. And Aedh built a church and monastery at Ardladhrann (Ardamine), on the land thus given to him. One day when standing on the seashore and looking towards Wealhas, Aedh said within himself: “I am sorry I did not ask my father, Dewi, to tell me who should be my soul-friend and confessor in Ireland.” The thought then came into his mind of praying to God to allow him to walk on the sea to Kilmuine. But at once an angel came and upbraided him for his rashness, saying, "You do not need any confessor besides God, for your soul is sinless. If, however, you wish to have a confessor take Molua.” He soon afterwards went to see Saint Molua. Whilst staying with him meat was one day put before him at dinner, and although he had resolved never to eat flesh meat he ate it then in the name of Christ and for the sake of Molua. Saint Molua when on his way to Rome went to see Aedh, and by his advice went home without going to the holy city. In the year 570 Aedh built a church and monastery near the royal fortress of Fearna (Ferns). There was once a great dearth of water whilst the monastery was being built. Aedh bade the Monks hew down a lofty tree. As soon as it fell a bright stream of water gushed forth (Tober-Mogue). Aedh gave to the Monks of Fearna the rule of life he had learned at Kilmuine. The Monks led a "common life:" worked daily with their hands in the fields, orchard and wood: read the holy books: prayed and fasted and fed the poor. He himself spent his time either praying, writing, or preaching. He often spent the whole night in prayer, and he fasted much. He lived entirely on herbs and water, and begged his food. He also abstained from murmuring and detraction." (Order of Irish Saints). He wore neither linen nor woollen clothes, but was clad with rough skins. Where the chaste Moedoc shall be (Aedh). Plain where holy songs shall sound. There Moedoc shall sing the psalter. Lord who rulest earth and sky. Bran-dubh, the successor of Colman, was a great friend to Aedh. He reigned from the year 576 to the year 604. Bran-dubh came one day to the monastery and seeing Aedh and his 150 Monks busy working in the fields he wondered much at their holy life. When Aedh saw the King he came to him and said to him: “All these are children of life except one." Bran-dubh answered: ”Show me that Monk; I will slay him." But Aedh said: “You shall not kill him; however you shall know him soon; all the brethren but he only will throw themselves on their knees when about to do the work of God: he will not." When the Monks had come back to the monastery at the third hour of the day in order to sing the praises of God in the church they prostrated themselves on the ground. But one Monk remained standing. The King spoke to him and said: ”Why did you not do like the other Monks?" The Monk answered: “My mind was wandering at the time and I forgot to do it.” This Monk left the monastery not long afterwards and was slain. When Cumasgach, son of the Monarch of all Ireland, was killed in the year 593 at Bealach-Chonglais (Baltinglass), by the followers of Brandubh, on account of his misdeeds, his father made war on the King of Laigen. Bran-dubh at once hastened from Hy-Ceinnsellagh to Bealach-Chonglais where Aedh at that time abode, and he sent Aedh to beg for peace, but the Monarch of all Ireland scornfully sent him away. Both Kings then made ready to tight. Before the battle Aedh said to Brandubh: "Many holy men have faithfully served God in your Kingdom. Go forward, therefore, and fight manfully. We shall be on the battle-field in spirit helping you with our prayers." Aedh prayed all through the night before the battle with outstretched arms, and besought God to give victory to his friend, Bran-dubh, the King of Laigen. The next day Bran-dubh won a great victory at Dunbolg (Donard), and the Monarch of all Ireland was left dead on the field. Aedh built a church and monastery at Cluainmore (Wexford), and another church and monastery at Seanbotha, at the foot of Mount Laigen (Templeshambo). As Aedh was one day driving along the road in his chariot he came to a field. The entrance to it was shut by bars of wood. Some noisy schoolboys were playing hard-by with spears and shields. The Bishop said to his companions: “The youth who shall take down these crossbeams for me shall be Bishop after me." One of the boys seeing the chariot stop at the gate threw down his spear and ran over to unbar the gate. When he had unloosed the crossbeams Aedh said to him: "What family do you belong to?” The youth answered: "I am from Luachra, in Mumhan, and my name is Cronan." Aedh then said: “You shall henceforth be called Mochua, and shall one day be Bishop." The lad begged Aedh to take him with him, and Aedh yielded to his wishes. He afterwards became Bishop. Aedh having heard that some Leinstermen had been made bondsmen by a Chieftain in Hy-Connaill-Gabhra (Limerick), set out there in order to free them. When he came there he begged the Chieftain to let them go, and he not only gave them their freedom, but also gave land to Aedh at Cluain-Claidheach (Clooncagh), whereon he might build a church. He worked many miracles in Hy-Figeinte. Whilst he was there a Nun died in the Convent of Saint Ite at Cluain-Creadhail. The sorrow-stricken Nuns sent word of it to the holy Bishop. He, full of pity, gave his staff to one of his Monks, and said to him: “Lay this staff on the dead body, and I pray God to be pleased to bring back this Nun to life on account of the merits of the holy Ite”. The Monk laid the staff on the dead body and at once the Nun came to life again. Aedh, when on his way home turned aside to visit the holy Virgins Ethne and Sodelbe and gave them a plough and two oxen for their Convent. Aedh then went back to Fearna. Whilst sitting one day at the foot of a cross, busy writing the psalms for a young disciple, he saw in vision the soul of Saint Colum-Cille going up to heaven. He prayed to God that his soul also might be taken up by angels to the heavenly kingdom. But he heard a sweet voice saying: “It is the will of God that you should still work a little while longer for the welfare of your neighbours.” He answered meekly: “Lord, may such work be mine as long as Thou wiliest." St. Molaise, his friend in his boyhood, when on his way to Rome came to see him at Fearna, and when he had come back from the holy city he gave some of the relics he had brought with him to his lifelong friend. Aedh said to him: "I am now indeed well speckled by you, I have got so many relics from you that I am all covered over with them as if with a breastplate." Saint Molaise answered: “This shrine of relics shall be for ever called the speckled shrine of Moedoc" (Mo-Aedh-oc). Another day as some men were speaking of the meekness of the holy Bishop, somebody said: "I will make him angry.” He went behind Aedh as he stood on the bank of a small stream and rudely pushed him into the water. The Bishop came out of the water smiling and with his clothes unwet, and the man seeing the miracle humbly begged his forgiveness. The holy man was now old and sickly, and worn out by penance and work. He breathed his last breath in the year 624 to the great sorrow of his loving people. The Roman martyrology says of him: “He was a child of prayer brought up from boyhood by Saint Dewi in monastic discipline and Christian perfection. He founded many churches and monasteries in Ireland, and handed down to very many souls the teaching he had got from that learned and wonderful master." His relic-shrine covered with gilded plates and his bell still exist. He is sometimes called Aidan and Mogue. His Feast-day is kept Jan. 31. Rev. 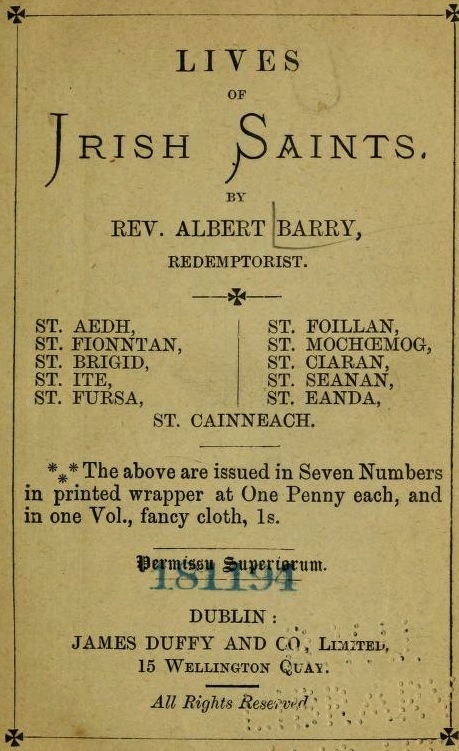 Albert Barry, Lives of Irish Saints (Dublin, n.d.), 1-18. Enan of bright Ros Rind. Enan son of Gemman in Ross mor in Hui Dega in Hui Cennselaig. The same as my-Menoc of Glenn Faidli in Hui Garrchon. 30. B. TERTIO KAL. FEBRUARII. 30. ENAN, son of Gemman, at Ros-mor, in Ui-Deagha, in Ui-Ceinnsealaigh. So, the possibility is there that Enan, son of Gemman, was something of a hagiographer himself and may even have written a Life of Saint Brigid. There is some confusion introduced as to where exactly the territory was in which he flourished. Ros-mor in Ui-Ceinnsealaigh has been identified as Rossmore, County Wexford, but the writer of the table in the Martyrology of Donegal has added Luighne. The earlier note in the Feilire Oengusa that Enan may be the same as my-Menoc of Glenn Faidli, suggests that he could be Saint Mohemog of Glenely, County Wicklow. The Scottish Drummond Kalendar records, that on this day, iii. of the February Kalends, St. Enan, Confessor, passed away to Heaven, in Ireland. 29. A. QUARTO KAL. FEBRUARII. 29. Blath, virgin (Flora V)..... 29 Jan.
Blath is the Irish word for 'flower', and so the Martyrology of Gorman makes a pun by recording her as 'blooming Blath'. Her name is thus Latinized as Flora. Eight bishops came to Brigit out of Hui Briuin Cualann, i.e. From Telach na n-epscop to Loch Lemnachta beside Kildare on the north. Brigit asked her cook, Blathnait, whether she had food for the bishops. Dixit ilia non. Brigit was ashamed: so the angel told her to milk the cows again. The cows were milked and they filled the tubs, and they would have filled all the vessels in Leinster, so that the milk went over the vessels and made a lake thereof, unde Loch Lemnachta 'New-milk Lough' dicitur. 523. Died Saint Blatha, or Flora, cook to Saint Brigid. but he does not expand on the reasons for doing so. M.Archdall, Monasticon Hibernicum, Volume II (Dublin, 1876), 271. Domestic arrangements are mentioned incidentally in the texts. A monastery usually had a kitchen separate from the refectory, and this was where the food was prepared. Meat had to be dried and salted. We know very little about how the Irish obtained their salt, although it was an essential commodity, and a lump of salt was an attractive present. It could have been obtained from sea-water by a process of evaporation, but there is some evidence that seaweed was collected and burned and the salty ashes used in curing meat. The monastic kitchen seems to have had no oven, and pottery is rare from excavated Irish sites except in the north-east. Dough for the bread was kneaded in wooden troughs and then baked on a griddle or baking flag, and bullauns which are often found on sites may have been used for grinding and preparing food. A cauldron, suitable for stews, was a luxury article, whilst meat might be roasted on spits or boiled in water heated by hot stones: clay pits or wooden vats could be used for this purpose. K. Hughes and A. Hamlin, The Modern Traveller to the Early Irish Church (London, 1977), 44.